As the year goes on, an increasing number of borrowers will be facing the dilemma of what to do once they come to the end of their fixed rate mortgage deals. Julia Harris, mortgage analyst at moneyfacts.co.uk, looks at the options available. Due to technical difficulties which included the crash of the online self assessment filing system, the Inland Revenue announced earlier today that the penalty free deadline has been extended to midnight 1st of february. However as I highlighted in yesterdays article - UK Tax Filing Deadlines - 31st Jan 2008, 1st Feb 2008 and 4th Feb 2008! , earlier court rulings had already ensured that people could submit tax returns up to midnight on 1st of Feb without incurring the £100 penalty. With speculation rife that the Monetary Policy Committee will cut base rate again next week, mortgage lenders have been preparing for the potential increased demand by increasing margins offered on tracker rate mortgages. Denise Harvey, mortgage analyst at Moneyfacts.co.uk investigates. “In the last two weeks alone, analysis from Moneyfacts.co.uk has revealed that 10 lenders have increased the margins on tracker mortgages by as much as 0.45%. 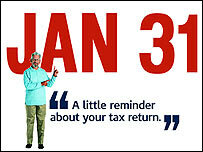 The UK Tax filing deadline is 31st January 2008, any return that is received on the 31st of January i.e. upto Midnight subject to tax office opening hours or online submission confirmation. However, returns received upto midnight 1st of February despite being considered as late will not incur an automatic penalty. As fixed rate savings continue to fall, Rachel Thrussell head of savings at moneyfacts.co.uk looks at what this sector of the savings market still has to offer. Rachel Thrussell, Head of Savings at Moneyfacts.co.uk, comments: “High savings rates have been a by-product of the credit crunch, as providers source deposits as an alternative option to raising funds on the money markets. Competition is still alive, with rates paying almost 1% more than Bank of England base rate in the variable market, and as much as 1.35% within the fixed market. The worlds central banks announced in December 07 that they would take concerted action to help ease the liquidity crises that has been gripping the financial sector since August 07. Whilst this has had a big impact on the interbank market, this article looks at its impact on the personal savings market. Concerted central banks action is attempting to cut money market interest rates, this has met with some success with the LIBOR rate falling from a peak of 6.8% to the current 5.75% This is resulting in a cut in savings interest rates, however the likelihood is that there will be further deep cuts in UK interest rates during 2008, therefore the warnings that I have been issuing over the last 5 months to lock your in Cash ISA rates now at high levels still stands, though the fixed rates approaching 7% are long gone. Research* from Nationwide Building Society has revealed that when it comes to finances, the number one New Year's resolution is to save more money in 2008. Nearly half of all respondents said that the one change they wanted to make in the New Year involved their savings, with 48% admitting they either wanted to save more or actually start saving money. With the end of another year rapidly approaching, now is an ideal time to reflect upon the key financial events of the past twelve months and what 2007 has meant for consumers. For most savers and investors 2007 has proved to be another challenging year. So how have the different products fared over the last year, and what have been the major developments? Andrew Hagger, Head of News and Press at Moneyfacts.co.uk, comments on the recent increase in short-term savings rates. “It seems that some institutions had pre-empted the recommendations issued by the FSA yesterday and may have already been assessing their funding and liquidity positions, as a result attempting to bring in more funds through the front door. Nationwide calls for tax reform on children’s savings as Christmas approaches. Research from Nationwide Building Society reveals that 75% of people in the UK don't understand the monetary value a 1% difference in mortgage rates can make. A 1% difference in rates on a five year fixed rate mortgage deal could be worth over £4,000*. When given details of two five year mortgage deals to compare, the largest group of respondents (28%) said they thought the difference on a £120,000 mortgage with an interest rate at 5.6% compared to a rate of 6.6% would be between £500 and £2000. Another 23% said they had no idea at all. Only 25% of people correctly identified that the difference could be £4,000. The loss of confidence in the financial sector due to the US subprime mortgage sparked credit crunch had resulted higher money market interest rates over the last few months. Though as warned in several previous articles, these high rates are slowly in the process of being withdrawn from the market in advance of cuts in UK interest rates. Though opportunities do still exist to lock in relatively high rates before the first cut in UK interest rates. The following table represents a selection of the best Cash ISA accounts currently available. The Child Benefit Agency has lost the personal details of every parent who receives child benefit, including names, addresses, dates of birth, national insurance numbers, child benefit numbers and bank accounts. As a result, 25 million people are now vulnerable to identity fraud if the data on two discs falls into the wrong hands. They aren't the only ones. In a matter of weeks, data breaches have been reported by organisations as diverse as Standard Life and Next. Halifax has announced today that it is reducing its core savings rates by up to 0.25%. Rachel Thrussell Head of Savings at Moneyfacts.co.uk the leading independent financial comparison site comments: “Whilst we have seen the launch of some competitively priced savings products this week, Halifax has bucked the trend by cutting rates on its core range. It is uncommon to see a provider reduce their rates in a period of base rate stability. With Christmas around the corner people are getting ready for one of the most expensive and stressful times of the year. A new survey by Nationwide Building Society has revealed that the majority of respondents (55%) still brave busy shopping centres to buy most of their Christmas gifts rather than shopping online. In addition to this the research shows that half (50%) of respondents do not know what rate they pay on the credit card they use most often.